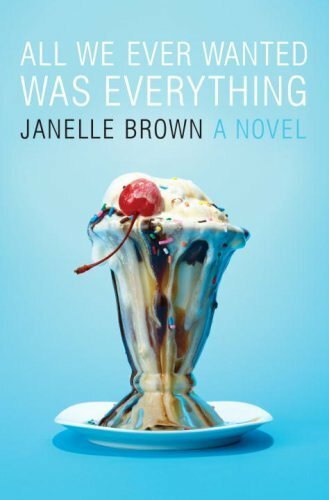 The fancy, dripping ice cream parfait on the cover is the perfect symbol for this novel: the promise of fun and affection that ends up impossible to deliver, both for the characters and the readers. Brown’s book is about the lifestyles of the wealthy and troubled: Janice has just learned her husband has cheated on her and has tricked her into signing away their fortune; Margaret, Janice’s daughter, has failed at her career and is running away from creditors hot on her trail; and Lizzie, Janice’s teenage daughter, has turned to promiscuity and food to heal her loneliness and pain. Brown’s writing is enjoyable; her ability to enhance certain moments is artistic and vivid, and she uses powerful sensory language (“show, don’t tell” is my mantra when I teach short story writing, so I can appreciate it when I see it done well, like in this novel!). I also thought her investigation into the minds and morals of her characters are, with a few exceptions, top-notch. I didn’t necessarily agree with a lot of the principals or conclusions drawn by the characters (especially the family’s reaction when Lizzie goes to a very stereotypical church – yikes), but I think the author did her job. So, while the writing is stylistically well-done, and the three main protagonists are all going through appropriately riveting struggles, the main problem is that I didn’t particularly like any of the characters! I especially found Janice and Margaret difficult to root for and often grating. After reading some of Janice’s sections, I honestly wanted to find a lady named Janice somewhere and give her a refreshing slap in the face. I didn’t, of course, but the characterization made me fight the urge! If I saw another novel by Brown on sale, I would buy it, I really would. But I don’t have it on my “to-read” list, and I wouldn’t necessarily go seeking it out. I enjoyed and appreciated the writing and don’t regret reading the novel, but it definitely did not feature the kind of endearing characters that would encourage me to come back for more.